19082016_The_Rise_Of_Germanys_New_Right_0028: The Rise Of Germanys New Right: Made in Germany: Hermann Bredehorst - editorial and portrait photographer Berlin, Germany. 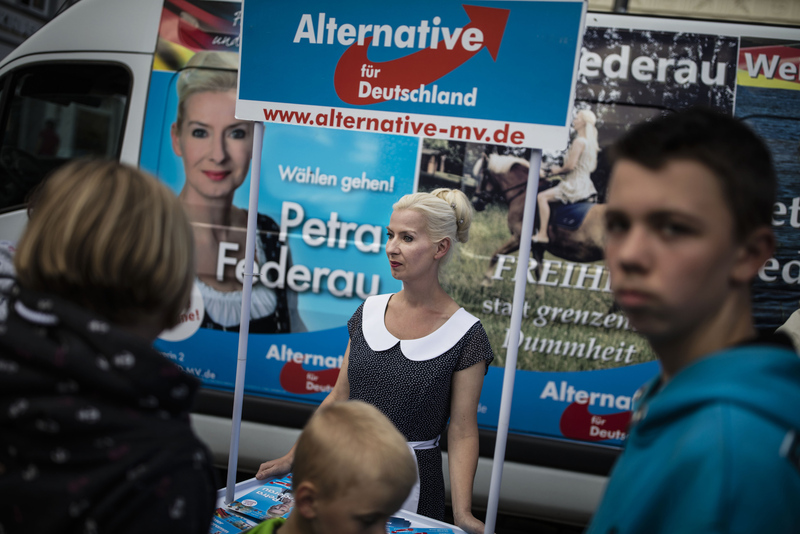 August 19, 2016 -Schwerin, Germany: Petra Federau local AfD politician takes part as Bjoern Hoecke, head of the Alternative fuer Deutschland political party (Alternative for Germany, AfD) in Thuringia and Leif-Erik Holm, lead candidate for the AfD in Mecklenburg Western Pomerania agitate a small crowd at an AfD party rally. The anti-immigration party is surging after Germany took in most of the more than 1 million refugees who arrived in the European Union last year. The party’s rise is narrowing coalition-building options for Germany’s established parties and threatens the status quo nationwide. Polls suggest the AfD will win up to 19% of the votes in this east German state of Mecklenburg-Western Pomerania, where Germanys Chancellor Merkel has her electoral district.